The Science of Reading: A Handbook brings together state-of-the-art reviews of reading research from leading names in the field, to create a highly authoritative, multidisciplinary overview of contemporary knowledge about reading and related skills. Margaret J. Snowling is Professor of Psychology at the University of York. Widely recognised as an expert in the field of children’s reading and language difficulties, she was awarded the British Psychological Society Presidents’ Award 2003 for distinguished contributions to psychological knowledge and is President-Elect of the Society for the Scientific Study of Reading. She is the author of the bestselling text, Dyslexia (Second Edition, Blackwell Publishing, 2000). Charles Hulme is Professor of Psychology at the University of York. His research is on memory, reading and language processes and their development. He was the joint recipient of the Dina Fietelson Award of the International Reading Association for research on reading intervention, in 1998. Part I: Word Recognition Processes in Reading:. 1. Modelling Reading: The Dual-Route Approach: Max Coltheart (Macquarie University, Australia). 2. Connectionist Approaches to Reading: David C. Plaut (Carnegie Mellon University). 3. Visual Word Recognition: Theories and Findings: Stephen J. Lupker (University of Western Ontario). 4. The Question of Phonology and Reading: Guy C. Van Orden and Heidi Kloos (Arizona State University). 5. Eye Movements During Reading: Keith Rayner, Barbara J. Juhasz, and Alexander Pollatsek (University of Massachusetts). Part II: Learning to Read and Spell:. 6. Theories of Learning to Read: Brian Byrne (University of New England, Australia). 7. Writing Systems and Spelling Development: Rebecca Treiman and Brett Kessler (Washington University in St Louis). 8. Development of Sight Word Reading: Phases and Findings: Linnea C. Ehri (Graduate Center of the City University of New York). 9. Predicting Individual Differences in Learning to Read: Judith A. Bowey (University of Queensland). 10. Social Correlates of Emergent Literacy: Beth M. Phillips and Christopher J. Lonigan (Florida Center for Reading Research, Florida State University). 11. Literacy and Cognitive Change: José Morais and Régine Kolinsk (Université Libre de Bruxelles, Belgium). 12. Comprehension: Walter Kintsch and Katherine A. Rawson (University of Colorado). 13. The Acquisition of Reading Comprehension Skill: Charles A. Perfetti, Nicole Landi and Jane Oakhill (University of Pittsburgh). 14. Children’s Reading Comprehension Difficulties: Kate A. Nation (University of Oxford). Part IV: Reading in Different Languages:. 15. Orthographic Systems and Skilled Word Recognition Processes in Reading: Ram Frost (The Hebrew University, Israel). 16. Early Reading Development in European Orthographies: Philip H. K. Seymour (University of Dundee, UK). 17. Learning to Read in Chinese: J. Richard Hanley (University of Essex, UK). 18. The Nature and Causes of Dyslexia in Different Languages: Markéta Caravolas (University of Liverpool). Part V: Disorders of Reading and Spelling:. 19. Developmental Dyslexia: Frank R. Vellutino and Jack M. Fletcher (State University of New York, at Albany). 20. Learning to Read with a Hearing Impairment: Jacqueline Leybaert (Université Libre de Bruxelles, Belgium). 21. Learning to Read with a Language Impairment: Margaret J. Snowling and Charles Hulme (University of York, UK). 22. Acquired Disorders of Reading: Matthew A. Lambon Ralph (University of Manchester) and Karalyn Patterson (University of Cambridge). 23. Spelling Disorders: Cristina Romani (University of Aston, UK), Andrew Olson (University of Birmingham, UK), and Anna Maria DiBetta (University of Aston). Part VI: Biological Bases of Reading:. 24. Genetics of Dyslexia: Bruce F. Pennington (University of Denver) and Richard K. Olson (University of Colorado). 25. Functional Brain Imaging Studies of Skilled Reading and Developmental Dyslexia: Cathy J. Price (University College London) and Eamon McCrory (Institute of Psychiatry, UK). 26. Teaching Children to Read: What Do We Know About How To Do It? : Catherine E. Snow (Harvard Graduate School of Education) and Connie Juel (Stanford University). 27. Recent Discoveries from Research on Remedial Interventions for Children with Dyslexia: Joseph K. Torgesen (Florida Center for Reading Research at Florida State University). "In the rapidly burgeoning, cumulative progress that characterizes our field today, this is the compendium that everyone needs. Graduate students and researchers alike will feast on this collection." 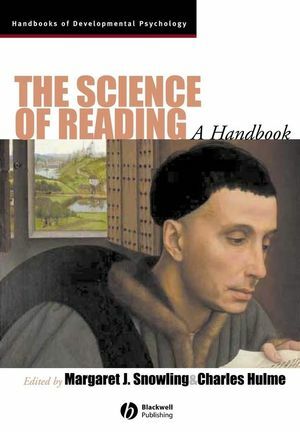 "This authoritative handbook defines the science of reading, reviewing the huge advances in knowledge over the last thirty years in a dazzling display of scholarship. No one interested in the psychology of reading can do without it." "At last! The handbook we've all been waiting for - graduate students and seasoned researchers alike - an authoritative, state-of-the-art source-book encompassing all the central topics in the science of reading, with an author list that reads like a Who's Who of basic reading research. The breadth and depth of each of so many seminal reviews confirms the status of reading science as one of the 'trophies' of modern cognitive science. I expect this will remain the definitive work for years to come."